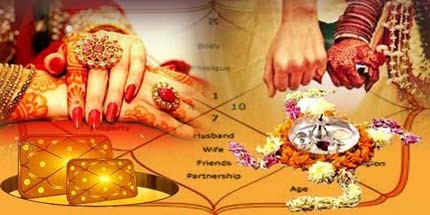 Mangal dosha, Kuja dosha or Manglik dosha generally comes up when we speak of marriages in India. But many people wonder what is Mangal Dosha that is giving nightmares to those in whose horoscope this dosha is present. Basically this dosha is the placement of Mars in the First, Fourth, Seventh, Eighth and Twelfth house of the persons horoscope. Some experts of astrology do also include the second house into consideration, however other experts differ in whether Mars in second house makes a person manglik or not. Mars is a fierce planet and its placement in any of the above house in Lagan or the Moon sign makes the person Manglik. Mars represent fire, negative influence of Mars can result in violence, quarrels, conflicts, injury to the self and to the partner. It can result in divorce and even death of spouse. Mars being an important planet has a great influence on the horoscope of the person. Looking at the fact that Mars in 1/4/7/8/12 makes a person Manglik about 50 percent of horoscopes in the world have Mars in these houses, hence does it mean they will all have terrible marriage life and problems. The fact is that although Mars in the above houses makes a person Manglik, the aspects of other planets like Saturn, Rahu, Jupiter remove the Manglik dosha from the horoscope. These are numerous permutations and combinations of planets and many well read astrologers and pundits do not analysis the charts properly and many times leaving the people who seek advice mostly confused. Below are some of the factor under which a Mangal Dosha gets Cancelled in a horoscope. a) Mars has aspect of Exalted Rahu. b) Mars has aspect of Saturn. c) Mars has aspect of Jupiter. d) Partially when Mars is the Yogakarka Planet. f) Mars is in its own house of Aries and Scorpio. Before you visit any Astrologer or Pandit take a Look at your horoscope and if you have Mangal dosha analyse Mars to check if the above conditions are present. If any of the above conditions are present then the Mangal Dosha is removed and you can rest your mind in peace. If not then you may contact me for further analysis. If you have issues related to Mangal Dosha in your Horoscope Matching, I have the Answers. Look forward to help you with this Divine Knowledge. You May order a Complete Mangal Dosha Analysis Report which will give you analysis of the Strength of Mangal Dosha along with if Mangal Dosha gets Cancelled as discussed above and also its remedies. You will know in detail the position of Mars and the effect that it may have in your married life. Yes you are Manglik to the core and your married life will be very painful. I want to know I am manglik or not?